it both durable and dishwasher-safe. Arkos AS has developed a completely unique and highly functional crab cutlery that is unlike anything else on the market. The cutlery is produced using high-quality stainless steel, making it both durable and dishwasher-safe. The Pagurus Crab Cracker is designed to accommodate a wide range of claw sizes and is powerful enough to crack through even the thickest of shells, without damaging the delicate meat inside. You must simply slide a crab claw between the cracker’s teeth and slowly apply pressure until the shell cracks. The Pagurus Meat Picks are expertly designed to consistently and easily remove large lumps of crabmeat without damaging the inside of the shell. The result is crabmeat that is both better-quality and free from grit. You simply insert the wider end of the pick into the claw segments, then, using a twisting motion, loosen the meat. All that remains is to draw out the large juicy pieces of crabmeat. 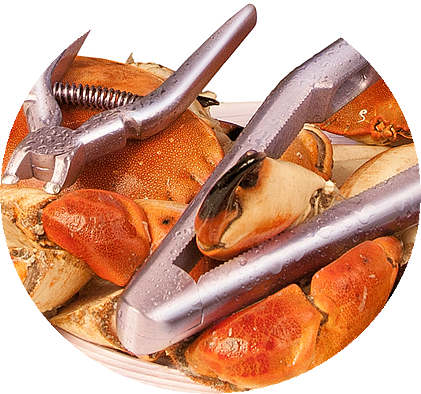 Use the narrow end of the pick to remove meat from the small leg-joints on the crab’s body. The Pagurus Claw Plier ensures that it’s possible to remove every last bit of meat from the claws. Simply fit the plier around the joint and tighten your grip until the shell cracks. You can then effortlessly separate the claw and middle arm segments, allowing you easy-access to the delicious meat within.